…even though I have been saying I’m not a jazz musician for the last 25 years; in the final analysis, an African-American with a saxophone? Ahh, he’s jazz! Maybe that concession is part of what led the National Endowment for the Arts to name Braxton one of the four NEA Jazz Masters for 2014. He, pianist Keith Jarrett, bassist Richard Davis and musician-entrepreneur Jamey Aebersold will receive their medals and their $25,000 awards on Monday evening. In a moment, we’ll hear one of Braxton’s controversial early recordings. But it may be helpful to first see and hear him discuss his approach to music. In 1969, when he was 24, Braxton recorded, on one of his arsenal of saxophones, For Alto, a two-LP album of unaccompanied performances. Braxton dedicated three of the album’s pieces to John Cage, Cecil Taylor and Leroy Jenkins, indications of his leanings away from the mainstream of jazz and toward the unfettered expression musicians were pursuing in the wake of Ornette Coleman’s, and Taylor’s, emergence. Here is “To Pianist Cecil Taylor.” You will see schematic drawings of roughly the kind Braxton has included in most of his album packages through the years. It may take this video a few seconds to come up on your screen. The NEA Jazz Masters ceremony, attended by the glitterati of the arts world, or at least of New York’s jazz community, will be streamed live from Lincoln Center. It will be on the web at 7:30 p.m. Monday on the arts.gov and Jazz at Lincoln Center websites. 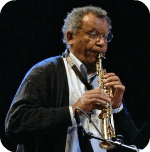 Whatever Anthony Braxton does, it certainly is music. A favorite is the album he made with Brubeck and Lee Konitz, All the Things We Are. Music that works beautifully. Transidiomatically. And even when one might agree that his music isn’t jazz, his music is certainly informed by Jazz to a high level. Besides, he is also one of the nicest human beings and a great, great musician. And it’s true: an African-American with a saxophone will always be considered a jazz musician, no matter what. So this is one of the only ways he will get support for his work and he earned it without a doubt. *Yes, and here’s Braxton’s recording of Desmond’s “Take Five,” from his 2003 album 20 Standards. Whether or not people agree Anthony is a jazz musician is really not the point. He most certainly is a man intensely focused on creating music on his own terms and has done so continually to the present. I was so enthralled as a young alto player to meet him on the street in Paris in 1973 and later work for him as the copyist for his recording Creative Orchestra Music 1976 and other projects. His influence on me then and now continues to inspire. Indeed, an African-American with a saxophone, contra-bass clarinet, contra-bass saxophone, bass saxophone, flute, clarinet, bass clarinet, piccolo, sopranino saxophone etc, etc. The NEA is absolutely right in awarding him this prestigious honor. I had trouble initially with Braxton. As a young listener, someone loaned me “For Alto” I had trouble with a lot of music back then. 🙂 Now I don’t know what was wrong with me. My ears opened up, I guess. It’s a gas listening to all the comments on this forum, It’s helped me navigate through some waters I have never really explored as well as giving me new appreciation for things I’ve always loved, like Jimmy Rowles recently..Cheers all.